The Infiniti Q50 has been shown in Europe for the first time and although it's being touted as a concept, it looks very much like a production-ready rival for the BMW M4 and Audi RS4. It's a four-wheel drive saloon powered by a twin-turbocharged 3.8-litre V6 from the Nissan GT-R, with a maximum power output of 575PS. Claimed performance for this new Q-car is 0-62mph in less than four seconds with a maximum speed of 180mph. 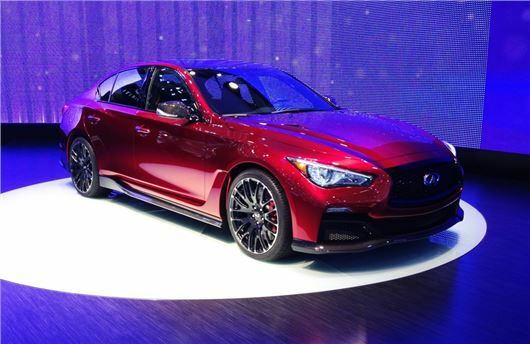 Although it's officially a 'high-performance', styling exercise it's expected that the Q50 Eau Rouge will go into production and will be offered in the European market. Cementing the company's close commercial ties with the Red Bull F1 team, the car also is said to feature heavily revised aerodynamics, which have been developed in conjunction with the Milton Keynes-based racing team. It's lower and wider than the standard Q50 and features a carbon fibre front spoiler, rear diffuser and side skirts. Extras also include 21-inch lightweight forged alloy wheels and a dual-exit sports exhaust system. There's been no word as to whether the car will go on sale in the UK.